Committing to home practice is such a transformational step that it’s very easily turned into a goal, an item on the to-do list, a get-through-to-get-done: in short, a duty. And setting aside the time on your calendar or to-do list can be an effective method for keeping this promise to yourself. But how to maintain the practice mind and not slip into goal seeking? Here’s what I mean: One morning you set your alarm a little early – 20 or 30 minutes to start – and feel triumphant because you kept this promise to yourself. And the practice, short though it was, transformed your day and was filled with moments of sunlight and inspiration. Three weeks later, the alarm rings again, you find yourself on the same mat with the sunlight streaming in, but can’t keep from pushing yourself through the poses you’re working, measuring your progress from yesterday, and none too flatteringly. What a way to start the day! 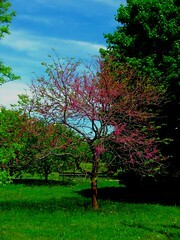 What happened to that first morning’s lightness and joy in the practice? What happened to that blinding insight from the Bhagavad Gita, something about releasing the fruits of action, putting your heart in but non-attachment to outcomes? If the “goal” is to meet yourself on your mat every morning, you’ve satisfied “duty” by arriving. Before you do anything, ask yourself one question: “What do I really want?” Maybe it’s more sleep. Fine, take legs up the wall, or yoga nidra. Maybe you’re feeling a backbend. Cool, warm up with some gentle heart openers like sphinx and cobra. Or maybe you need a good laugh or cry. Nice, that’s pranayam. You might even find that when you follow it, your desire changes, transforms into something that supercedes goal, need and thought. Stabilize your pelvis by drawing your hips toward one another: I know, my class today collectively got their Scooby faces on for this one. They’ve grown used to me giving the instruction to press their sitting bones or upper legs apart, but drawing together? Eyebrows go up, spines come out of poses, lips purse. No problem: same muscles as pressing the legs apart, but draw together. Draw pelvic floor up…. yes, this is the beginning of Mula Bhanda. Exhale, begin to turn from deep in the belly. Drawing your core muscles closer to center, draw one side back and draw the other closer to mid-line. (Find your mid-line by drawing all your muscles close to center on each of 7 successive outbreaths.) After you’ve turned in your belly, begin to use internal – not external, like pressing away – shoulder strength to turn through the thoracic spine, and only then turn your head. Revolved poses are regenerative alone, and can be used to counter-pose both back and forward bends. Great for digestion and releasing low back and hips, they make for a great night’s sleep. Move slowly and with deep respect for your whole body and your intuition, and you’ll be twistin’ the night away. 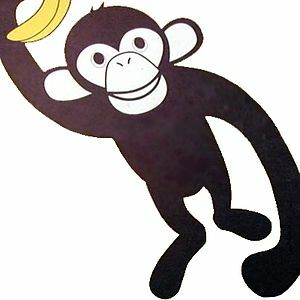 Facing the Monkey: take the banana or hug the monkey? By “contained” I mean a class lasting a certain amount of time with a plan. Currently, I’m teaching a class for Presbyterian Health Plan in an exciting experiment: 12 weeks, 2 hour and a half classes a week, vital signs and stress scale monitored before and after the first, 13th and 23rd classes (we’re taking Thanksgiving Day off). Participants signed a contract committing to attend from beginning to end with no more than 3 misses and participate in the vital sign and stress scale monitoring. For this, they receive classes and a mat free, where they work, and the Health Plan pays me. The syllabus is below. Last week were classes 5 and 6, “Forward Folding: The Turn Inward.” Before the sixth class – so only 5 classes under our belts – six different people came up to me at separate times with stories of lost pain and found calm that bring tears to my eyes even now. At this same juncture, nearly an equal number dropped out. What gives? Even the people who dropped out had stories of transformation. So why quit now? The reasons given overwhelmingly had to do with family commitments, but the trends and the timing make me wonder if there isn’t something deeper going on. During my first morning practice yesterday, I was churning and turning in preparation for next weeks’ “Twist” classes, and you would not believe the endless clumps of unrelated and mostly unimportant detritus my mind heaved up. But occasionally there would be an “important” bit and I’d catch myself about to run off and “take care of it” before taking a deep breath and recommitting to the pose. And it occurred to me: this is probably what the students are experiencing, too. Probably not the first class, or the third, but maybe by the fifth they’ve had the experience of both Sivasana Bliss as well as the monkey mind taunting them, something like this: “Really, 3 hours a week? How important are your hamstrings when you haven’t returned that book or done the shopping for little Lisa’s party this weekend? Aren’t you special, having your special yoga class, what makes you so special?” And so on. At least that’s what my monkey sounds like. Annoying little primate. When we engage something new and potentially transformative, the first decision is to begin, and this requires a certain activation energy, curiosity, and acknowledgment of a need. The next decision is to continue and requires balancing the original need being met by the activity against other needs and the ability to regard them all dispassionately. This second decision probably happens for most of us after the first one has been made repeatedly, because those prior attempts are how we build up the space in our minds to make the second decision. So I’ll count even the dropped students as successes, though they won’t add to our “experimental” results. Each one of them has built up their stock of experience in choosing health and transformation, and learned something more about their own responses to stress and quiet. Here’s to the monkey dance! When we’re full of bananas, we each learn to hug our monkeys. Just completed a fabulous mini-home-retreat. Usually I design and create these for myself, but I’ve found a meditation teacher who has honed the content and delivery to a “T”…. or maybe “M” for mindfulness. 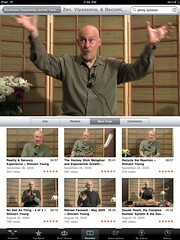 Shinzen Young‘s basic mindfulness home retreats feature his program of methods for mindfulness and are awe inspiringly powerful. One of my “aha” moments during the four hour combination of didactic instruction, interaction, and sitting meditation made communal by the use of the internet (I use Skype to connect, quite happily) was Shinzen answering a question after the first technique was practiced. “Equanimity” is one of those words you’ll hear as often as “cool” in yoga and meditation circles, so hearing Shinzen apply his scalpel like mind and bring the discussion back to the definition is always refreshing. One of the many things I appreciate in his teaching is that he is truly a philosopher in the Socratic sense: philosophy is a practice as well as a system of interrelated definitions supporting clear thinking. He reminded us that equanimity is the skill of allowing images, thoughts, feelings or sensations to arise “without push or pull,” without moving toward or away from them, without craving or aversion. Equanimity is what we exhibit when we allow these experiences to arise and pass away without our interference – perhaps without even our explicit notice. And he asserted, if I understood properly, that this is our psyche’s healing mechanism. The intuitive appeal of this theory has me looking into his deeper philosophy, but for now all I can say is that it makes sense to me and resonates with my experience. I had an image of the desert plateaus and canyon floors I spend so much time traversing. After a good rain, an infrequent phenomenon to be sure, bits of the past surface with as much ease as spring water seeping through cracks, to be worn away and converted to light and heat by the wind and the desert sun. What a blissful new way for me to relate to sitting. How do you define equanimity? You may not realize you were holding your breath until you let it go. And in that great whoosh of exhalation you have an amazing opportunity: what was going on in your internal environment leading to that impressive subversion of sustaining rhythms? 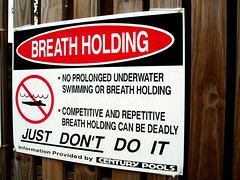 Breath holding, as the sign says, can be detrimental, though perhaps not often deadly. Because of the interruption of normal exchange of nurturing and toxic gasses, you’re retaining the very stuff your body so wisely was prepared to let go. More importantly, you can’t receive the next breath. Mind rides breath, so you remain stuck in that moment, unable to move forward because like the monkey with a peanut in his fist, you can’t get your hand out of the jar. Whether you’re on your mat or in traffic with that near miss, or in a meeting – “Yeah, those words just came out of his mouth…” – the moment when you let your breath go, give yourself the gift of wondering what that was all about. 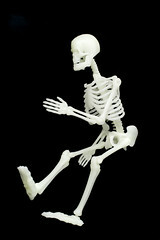 I’ll wager a week of yoga class that in every case it’s a reaction to one of three things: novelty, fright or exertion. Novelty: ever been taken by surprise, even a pleasant surprise? A room full of unexpected people, a man on one knee with a diamond ring or an unexpected visit from a friend: any of these can trigger a rapid, rushing intake of air with a potent pause. Fear: the unexpected discharge of a gun; a rapid, unexpected motion when you are either very relaxed or very wary; watching the car in front of you spin out of control all can trigger a frozen or elongated moment and the breath can become hostage to the halting motion of time. Exertion: You didn’t wait for help to move that massive walnut bureau, and so it’s no surprise when you’re over matched and noticed the squealing grunt of strain. And in some forms of exercise, such as kettlebells and boxing, breath holding is a technique – but accompanied by specific and intentional exhalation. This kind of breath holding creates an internally stabilizing pressure in the center of the torso which is then converted to force with a rapid and full exhalation. The key is intentionality. Solution: Awareness and Intent The next time you find yourself holding your breath, treat yourself and your breath gently, kindly release and exhale fully and completely. Wonder: was I scared, surprised or exerting? Bring your awareness and intent to the moment, ask yourself the question, and then just listen. You’re extra lucky if you have a chance to practice this on the mat, because you have a great chance to notice and loosen a pattern, referred to in yogic circles as samskara. Samskara are the ant hills of repeatedly going around a place of resistance, rather than investigating and remaining with the resistance itself. Noticing breath holding is one way down the center of hill to find the source of the resistance, the source of the work around, and clear an open path for moving forward, letting go of the residue of prior experience and becoming present for all that this moment holds.